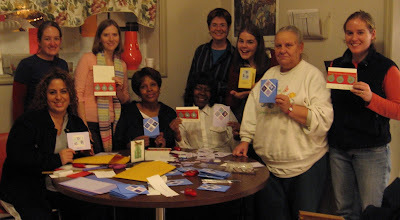 We gathered together on November 29th to make Handmade Cards. The instructors were Jen Burkhart and Amanda Hatch, two coworkers from my days at People's Light and Theatre Co. They have been making cards professionally for a while and they had several styles for our participants to choose from. Everyone left with 10 finished cards or the supplies to finish them at home. We had a loud, rambunctious group; several renditions of "Let It Snow" broke out. On the response card, one participant remarked, “Thank you for the free time for myself.” Great. That's the idea.